Help make it feel better. 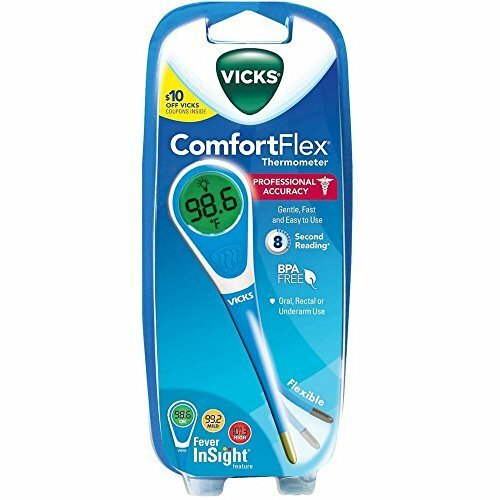 Uses: The Vicks ComfortFlex Digital Thermometer with SpeedRead technology, large screen display and Fever InSight feature makes taking temperatures fast, easy and comfortable. For use orally, rectally or under the arm. Features: Fever InSight: Large color changing display with backlight. Fast 8 second reading. * Accurate readings within +/- 0.2 degrees F. Waterproof. Memory recall. Storage case inside. *Results will vary by individual and method used. Clinical results range from 8.1 to 38.0 seconds. Average read times in clinicals: 13.0 seconds rectal, 19.0 seconds oral and 22.0 seconds underarm. Memory feature recalls and displays last temperature taken. If you have any questions about this product by Choice One, contact us by completing and submitting the form below. If you are looking for a specif part number, please include it with your message.